This morning we had a shower and breakfast in Wal-Mart’s car park before setting off back down to the USAF Museum at Wright-Patterson airfield. The trip there this morning was so much easier. We had requested an address whilst there yesterday which our Satnav would accept. We were given 5717 Huberville Rd, Riverside, OH 45431, which is a hotel across the road rather than the Museum’s address of 1100 Spaatz Street, Wright Patterson Air Force Base, OH 45433-7102. We were there in no time. According to our milometer we had only been 6 miles or so from the Museum whilst sat at Wal-Mart, and not the 16 miles we travelled yesterday observing the devastation to the suburbs of Dayton enroute, which is nice if you have the time to empathise with your fellow man, but we hadn’t. On arrival we booked in for the Presidential Tour, for which we had to produce our passports. This was because the two hangers, one for former presidential aircraft, and the second for experimental aircraft, were housed on the live and operational side of Wright Patterson air base. We had timed it well as a tour was due to leave just ten minutes after we arrived. We made straight for the Boeing 707 which was President Kennedy’s ‘Air Force One’; in fact this aircraft served all Presidents from Kennedy to Clinton. 0n this plane Vice President Lyndon B. Johnson was sworn in as President of the United States whilst John F. Kennedy’s assassinated body was being returned to Washington in the aircraft’s cargo hold. We were allowed onboard, though each section was sealed off with thick clear Perspex to protect them. I have to say that having looked around all 4 of the Presidents planes open for viewing that none of them came close to the interior of Elvis Presley’s 707, though to be fair these were functional working planes which had to accommodate far more flunkies than Elvis had. After the tour we returned to the main part of the museum to take some more photographs before finally leaving for the Wright Memorial and Interpretive Center which are about 3 miles from the museum, but still within the Wright-Patterson complex. Orville & Wilbur ran a printing business at 22 S Williams St, Dayton www.nps.gov/daav . Beneath it was a bike shop and workshop facilities. It was the printing business and bike shop which were their sources of income, and it was to be their knowledge and experience of bikes which was to stand them in good stead for their designs for a flying machine. Their first flying models were gliders, some big enough to lie down on, whilst they flew a few feet high tethered to the ground. They even built their own small wind tunnel in which to test their wing shapes. 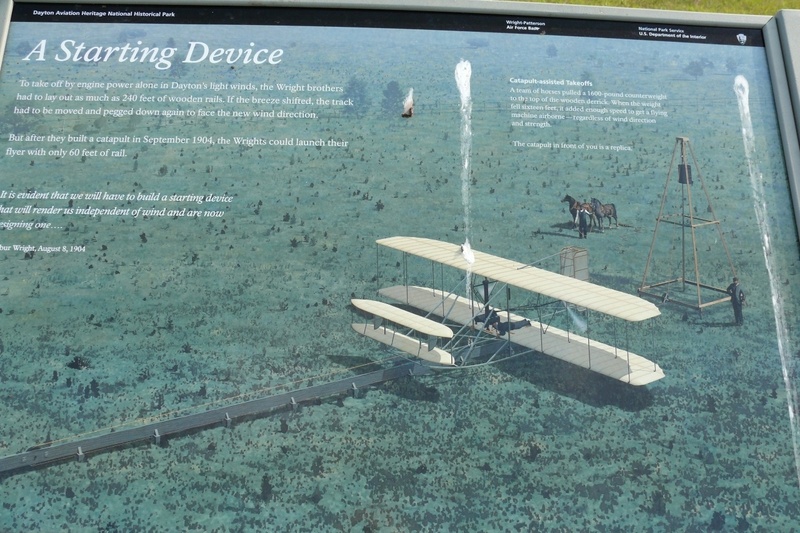 They were to use the windy peninsular of Kill Devil Hills near Kitty Hawk, North Carolina, on the Atlantic coast to perfect their kite wing designs before building their Wright Flyer, the first powered heavier-than-air flying machine. That first successful flight was on December 17th 1903 at Kill Devil Hills, Kitty Hawk. The aircraft only travelled about 300ft, but by the fourth and final flight that day, they’d reached over 800ft. But it was uncontrolled flight, they had yet to perfect the control skills that would give them predictable flight with the aircraft. That’s where Prairie Field came in. The brothers needed somewhere to develop their flying machine and as Orville had visited the field years before to sketch and paint flowers, and was aware of its presence, they approached Mr Huffman a local businessman and farmer to rent the field. Huffman agreed and charged them no rent provided the brothers moved the cows away before they flew, later telling friends he thought both brothers were mad and that it would never work. It had been a recently introduced electric trolley service from Dayton town which made the field accessible to the brothers. Over the next two years the brothers perfected controlled flight culminating in numerous circular flights over Prairie Field. In the field is a replica hanger built at the original location in to which the partly dismantled aircraft was stored, together with a replica catapult system used to launch the aircraft down the track after the pilot released the cable holding up the concrete weight. 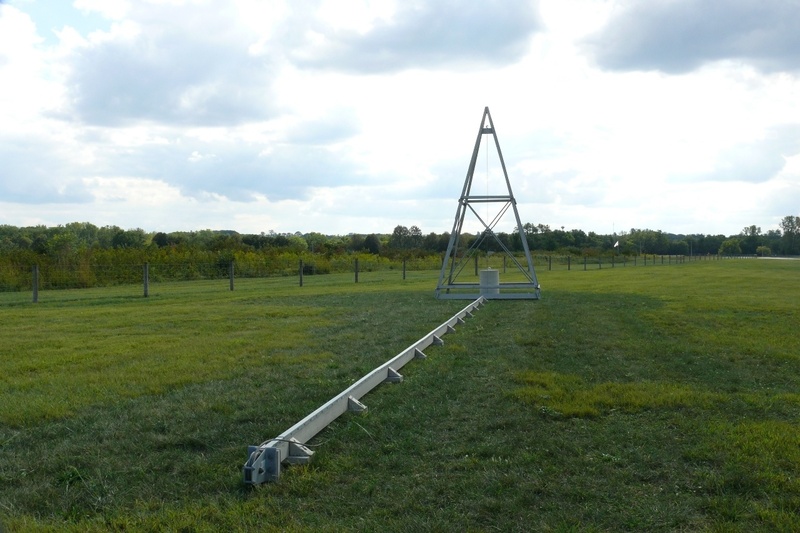 This enabled the brothers to test their aircraft in any wind conditions rather than having to continually re-lay up to 200ft of track each time the wind direction changed. Having walked across the field and looked around the hanger etc we left the site. What was rather poignant was that the field was right next to Wright Patterson Air Force Base where development in flight systems and materials continues today. Time was getting on and so we set out for John Bryan State Park about 15 miles from the air base. Having spent two nights in Wal-Mart car parks we felt we’d earned the benefit of full facilities. Unfortunately the journey was considerably longer than 15 miles, due to road works and road closures, perhaps due to trees still lying in the road, bought down by the recent storms. Shortly before we arrived at the campground we crossed a wooden bridge at Yellow Springs which had a 3 ton weight limit with our vehicle weighing more than double that. I just held my breath and drove over it swiftly, saying a little prayer on the way across as there didn’t seem to be any other way to reach our destination. 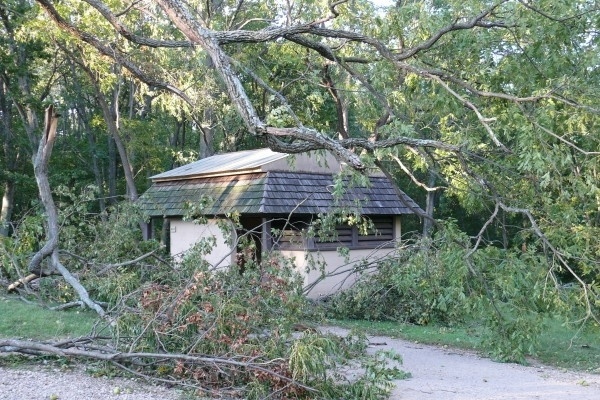 John Bryan State Park was full of trees and branches which had crashed down in the storms, it was a real mess. The campground volunteer host had deserted his post and left everybody crazy enough to camp there, to their own devices. Having dumped our waste water we discovered there was no fresh water available, and we were completely out of water except for bottled drinking water which we would never allow ourselves to run out of. So there we were all tanks emptied, but with no means of flushing the loo, have a shower or do the washing up. We found ourselves a pitch in the absence of anybody to allocate one to us, only to find when trying to plug in to the electrical supply that there was no electricity either, annoying but not a huge problem since we have an onboard generator. It was the lack of water which was of greatest concern. Never mind, stiff upper lip and all that. I set about gathering as much firewood from the fallen timber as possible. I had a lovely pile by the time I’d finished my ‘wood round’. I set us a challenge – to prepare a hot meal and drink, without having to resort to the generator, gas oven, gas rings or microwave oven. Firstly the fire was prepared and lit in the Fire Ring/Grate. Once it was established, out came the camping kettle and mess tins I’d bought over with us for the first trip. Bacon, egg, and potato wedges cooked over a roaring fire out in the great outdoors was a very satisfying way to end the day. After eating I flipped the grate out of the way and set about piling the wood on the fire creating a roaring beauty, probably the best on the campground though there are only 4 other couples mad enough to be camping here and only one other who could be bothered to light a fire. 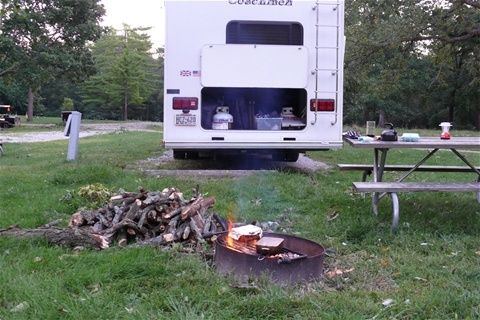 LOCATION TONIGHT: John Bryan State Park, 3790 State Route 370.